The day of your wedding is an absolute whirlwind. So much to get done in so little time (and so many things you can forget). You don’t want to be at the at the edge of the aisle as a great big piece of hair falls from your otherwise perfectly done ‘do and have nothing to pin it with. 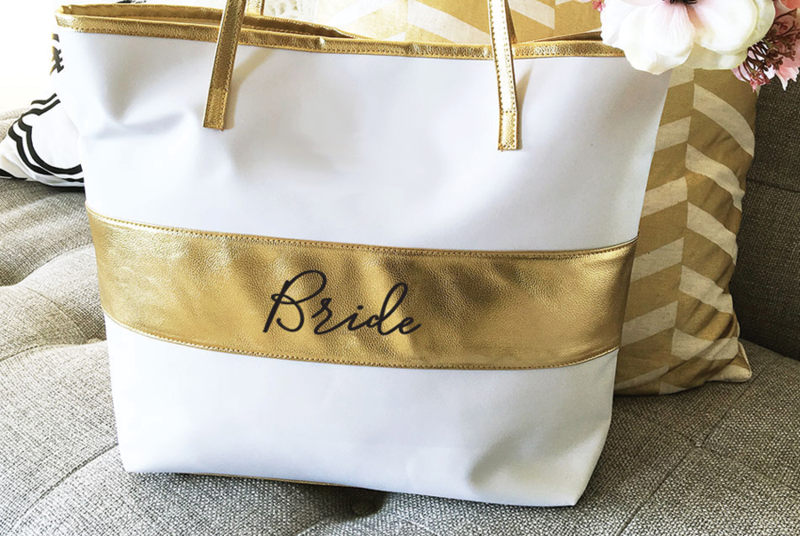 Having experienced it myself, I can attest it’s nice to be prepared with a “Wedding Day Bridal Kit.” Below is a list of all the items I was happy to have packed and some I really wish I would have. Anything I missed that you were thankful to have handy on the big day? Tell us below! You’ll need your own and your bridesmaids’, unless they are bringing their own. Your hair and makeup will be done hours before the wedding begins, and you’ll probably have snacks and/or a small luncheon in-between. Touch-ups will be a must. If you like the color your makeup artist used, ask at the trial the brand and color number so you can match it perfectly later. No need to wear your beautiful, yet uncomfortable shoes to the salon, but don’t forget them! Throw on a pair of sneakers and pack your bridal shoes in your bag. Pro tip: wear a button-down shirt for getting your hair and makeup done so you won’t have to maneuver your top over your flawless locks. Just toss it in your bridal bag later to take home at the end of the night. Anything can happen to a wedding dress between putting it on and walking down the aisle. It’s helpful to have a small emergency sewing kit handy, especially a scissors for loose threads. It’s hard to do the garter toss without it! Trust me, you and your bridesmaids will get a bit hungry. Depending on the size of your party, you will likely start getting ready about 7-9 hours ahead of the wedding. It would be like going a whole work day without eating a thing. I was partial to trail mix and anything else easy to eat with your fingers that wouldn’t be too messy or filling. Water is essential as well, especially as the bride. Sometimes it seems those darned falsies will never stay completely on, and you might have some bridesmaids not used to wearing them that might rub their eyes before realizing. Being up early, sitting in a chair for a while, and just generally having nerves can make your head feel achy. Bring a small bottle of aspirin so you’re clear-headed for the best part of the day. With those extravagant updos, some hair is bound to fall out or your veil could go crooked, and you will be happy for the extra support. I would suggest purchasing some extra-large ones for the heavier jobs, especially if you have a lot of hair. Cotton swabs, tweezers, toothbrush, toothpaste, and floss will all be useful. I especially recommend the toothbrush so they have that just-brushed shiny glow for pictures. I know it seems silly to mention, but don’t forget your ring or his. Packing these up in your bridal bag the day before helps you have a bit of peace of mind that you won’t leave them sitting on your bathroom counter. You’ll want smooth, silky skin for your wedding day, notably for your feet since your photographers will take pictures of you putting on your shoes. I also used it on the inside of my husband’s ring so it would go on nice and easy during the ceremony (and it did!). You may need some fabric tape with you to make sure the dress sits perfectly in each area. Your dad will thank you for saving his suit! Remember to bring it with you and keep it on ring. Your hairdressers, florist, wedding coordinator, and so on may need to get in contact with you at some point during the day. Chips happen. Just be sure to keep that bottle far away from your dress! If you’re not wearing all of these items, then just remember to pack them in your bag so you don’t have to rush around looking for them the morning of the wedding. There is something about smelling lovely that makes you feel that much more beautiful. As my friend suggested before I got married, purchase a new bottle of perfume that you wear for the first time on the wedding day. That way anytime you wear it from then on, it will bring back sweet memories of when you married the love of your life.